There are many people today who suffer from heavy metal toxicity. Toxic heavy metals like arsenic, lead, cadmium, aluminum and mercury are found in just about every part of modern life. PVC plastics, rat poison, deodorants, some cookware, paints, pipes, pesticides, fertilizers and gas emissions, to name but a few, all contain toxic heavy metals that pollute the air, water systems and our homes. Based on this, there is probably not a soul who does not have toxic heavy metals in their cells to some degree or another. One of the most controversial forms of heavy metal toxicity results from amalgam fillings. Amalgam fillings are actually illegal in a few countries because they contain a lot of mercury, about 50%, that leaches into our bodies. The controversy arises from the fact that amalgam fillings are still legal in many countries and endorsed by some dentists and health professionals, while others speak openly against them. Anyhow, to make a strong point, some scientists experimented on sheep by giving them amalgam fillings to test out how much the mercury actually leaches into the body. After 6 months they removed the fillings and the disturbing result was that only 1/5 of the mercury was left! The other 4/5 was found concentrated heavily in the brain and small intestine. Deposits were also detected in the lungs, liver and kidneys. Fortunately there is a method for helping us remove toxic heavy metals from the body called oral chelation. There are some natural foods and herbs and some tailor-made supplements, such as EDTA, that all act as oral chelation agents, otherwise known as oral chelators. 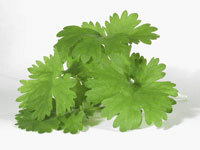 The good news is that for those with amalgam fillings there is an all natural oral chelation agent that we can take – cilantro! A scientist found that patients excreted more mercury out of their body when they ate soup that contained cilantro. Intrigued the scientist conducted several more studies to find out that liquid cilantro (or liquid parsley, they are closely related) supplements in particular had the most powerful effect at flushing mercury out of the body.